From toddlers through pre-teens, girls need to know that God is the friend they can count on as they mature. The God and Me! series teaches them to rely on Him as they learn more about the Bible and themselves. Each age-based book includes over 100 devotions and activities to help girls establish a dynamic Christian life. GOD AND ME! is available in books specially created for the needs and interests of girls ages 2-5, ages 6-9 and ages 10-12. About "God and Me! 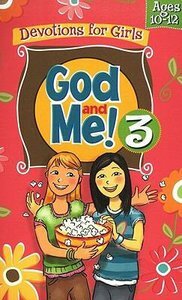 #03 (Ages 10-12) (God And Me Series)"
Linda Washington has authored and coauthored more than 20 successful books, including Promise Kids on the Promise Path; Celebrate Jesus: Come Hear the Best News Ever; Find a Friend in Jesus; Gotta Have God; God and Me; 4,000 Bible Questions, Answers, Puzzles, and Facts; and Jamall's City Garden. Her series A Piece of My Mind is for girls ages 812 and is designed so that each book can serve as an every-other-day devotional.